I want to expand a bit more on the traditional Greek dance forms, and share some more interesting details I’ve learned about these ancient practices that still are continued today. One of the most well-known of the ritualistic uses of the dance is in the Greek Orthodox wedding ceremony. First, the couple are crowned with flowered crowns, then the priest joins their right hands together, and later the bride, groom, and priest perform a dance procession around the altar, circling precisely three times7. There are many other uses of the Greek dances, used on occasions of “rites of passage” in life. 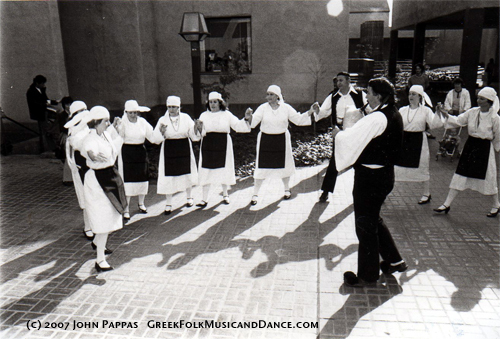 Greek dancing in Foustanelles costume (men) and Florina costume (ladies). 1970s. Used with permission. Such details make a study of the Greek folk dance costume even more intriguing. Many of these elements can be seen in the photographs of the Greek dancers above, and at the beginning of the article. 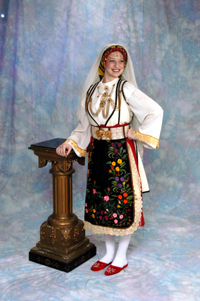 More examples of this costume and textiles can be seen at GreekFolkMusicandDance.com, GreekFolkDancers.com, and the Museum of Greek Folk Art. One of the more interesting accessories worn by the Greek dancers, and in daily wear, was and is an apron (called in Greek a podia or bodia). This is one of the most ornamented and decorated articles of clothing worn by the Greeks and also one of the most important. The designs embroidered on the aprons have “religious and magical significance”14. 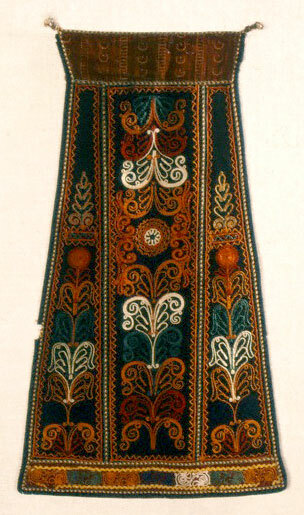 As can be seen in the links given above, the embroidery’s design on the Greek aprons is usually based on stylized vegetation, viz floral motifs, vines, leaves, etc17. The reason for this is because these designs usually are a depiction of the Tree of Life. Sampler, England, 1826. 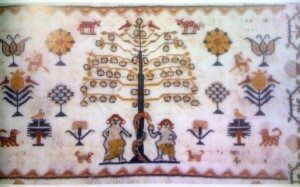 The tree of knowledge is a widely used motif in many English embroideries of the 19th century. (Embroidered Textiles, Sheila Paine.) Click for larger view. Some scholars believe that the fig leaves that Adam and Eve used to make their aprons in fact came from the same tree that they had just eaten the forbidden fruit from, i.e. the Tree of Knowledge in the Garden of Eden (Gen. 3:6–7). Studying the traditional Greek folk dances reveals that they are very rich in history and culture, and date back anciently to religious beliefs and practices, particularly the ring dance around the altar. The suggestion that these traditions seem to have changed little since ancient times gives us a glimpse of how things might have been millenia ago. Clearly, there is much more can be learned from a study of this subject. Do you have any additional insights about the Greek folk dances? Please share with us in the comments. I don’t have any particular insights into the dances, but I want to verify that there are many astonishing correlations and parallels of Greek Orthodox practice with LDS practice. We need someone of the stature of Nibley (I know that is asking too much) to do a thorough analysis of these correlations and parallels. I am convinced there is a gold mine of findings yet to be discovered. Most of my extensive knowledge of Greek customs and traditions comes from the film My Big Fat Greek Wedding. Now that I’ve read your article, I find it very interesting that in that film they do perform a circle dance with everyone holding hands during the wedding festivities. Another random thought: A circle dance is performed around a tree at the end of How the Grinch Stole Christmas. With the Grinch cartoon the “Whos” dance around a tree in the beginning. Then at the end when all is right and the Grinch is with them, they dance around a ball of light. There is no explanation for this in the story. Good thought Kevin. It would be interesting to find out what Geisel’s (Dr. Seuss) inspiration for that was. Looking for cross-cultural connections to the Greek tradition, we almost immediately happen upon the May Pole traditions of Western Europe. This is yet another ring dance with correlations to the Greek tradition and my thesis of the Polar Configuration. According to scholars, its cosmological overtones are indisputable. The fixation of a “center place” in the European traditional ring dances, connected by streamers to each participant as they weave in and out in opposite directions, is strongly reminiscent of the “mountain” imagery of scripture, also cosmological. It’s also connected to the traditional and cultural spiral stairway called “Jacob’s Ladder,” seen as the path to heaven, part of ascension tradition. The spiral stairways in our early temples, I affirm, echo that same tradition. It is closely related to the Hieros Gamos, Greek for “holy marriage,” or in our lexicon, “temple marriage,” where the participants huddle in a circle around the central couple. The Native American ring dances are yet another cultural variation on a cosmological theme common to almost every ancient culture, again invoking astral gods. I could go on, but I think this should be sufficient to make my point. And that is: The circular arrangement of sacred ritual and rite is universal, common to all ancient cultures. It’s not limited to this or that ancient tradition; it’s related to all ancient tradition. That Joseph Smith should reinstate this element within our sacred rites is further evidence of his authenticity as a prophet. Bryce, This was loaded with significant correlations to the temple. One more example of how the temple was known everywhere but was lost in the mists of time and the traditions of men. Dr. Huge Nibley wrote that members of The Church of Jesus Christ of Latter-day Saints, believe that their temple mysteries, (ordinances), go way back into primitive history, and that they are as old as the human family. Furthermore, they represent “a primordial revealed religion that has passed through alternate phases of apostasy and restoration which have left the world littered with the fragments of the original structure…” Some fragments “are more and some less recognizable, but all badly damaged and out of proper context.” (Dr. Huge Nibley, The Message of the Joseph Smith Papyri, an Egyptian Endowment, (Salt Lake City, Utah: Deseret Book, 1975), explanation p. xxi). 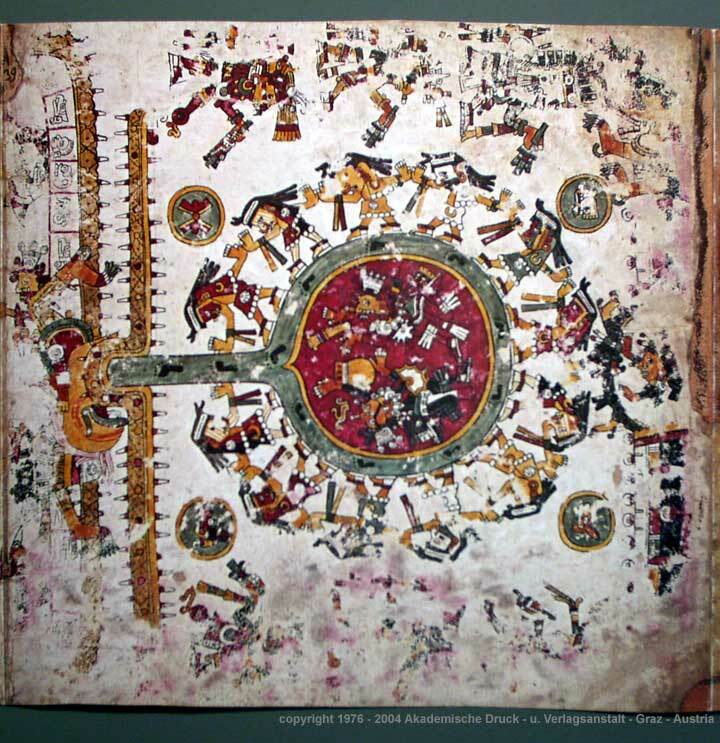 With this in mind, what are we to also make of art works show Aztecs were doing? It’s also interesting to note that we can find these rituals in the art works, and traditions of later Indian tribes, such as those among the Mayans, Aztecs, and the Hopi Indians. Maria—Gabriele Wosien, 1974, Sacred Dance, Encounter with the Gods, (New York, New York: Thames and Hudson, 19 86), pp. 26—29, see also figure 34, and pp. 124—25, figure 73; E. Cecil McGavin, Mormonism and Masonry, (Salt Lake City, Utah: Stevens & Wallis, Inc., 1947), pp. 178, 180, & 182. Tedlock, Popol Vuh, p. 146; Churchward, The Signs and Symbols Of Primordial Man, p. 331, fig. 134, —A; Compton, By Study and Also By Faith, Vol. 1, chapter 24, The Handclasp and Embrace as Tokens of Recognition, pp. 636— 37, note 54, mentioning Frank Waters, The Book of the Hopi (New York: Viking Press, 1963), p. 252. Nibley, Mormonism and Early Christianity, see the chapter on Early Christian Prayer Circles. Joseph Campbell, Joseph Campbell, The Power of Myth, with Bill Moyers, color plate 4 between pp. 108 & 109. Krishna Dances with the Cowherdesses, India, 17th century. A couple consisting of a female and male, join with other couples in a circular dance holding each others hands. Krishna Chaitanya, Arts Of India, (Hauz Khas, New Delhi: Shakti Malik, Abhinav Publications, first published in India, 1987), fig. 58. Ras Lila, Krishna’s dance with the maidens is similar to the Aztec circular one. In both of these, they raise their hands up and touch each others’ hands in these circles. In the middle of these circles are three figures too. Terracotta, Bengal, 18th century A.D. carving in stone. See also plate XXXIX. Kalamkari temple wall-hanging depicting Ras Lila. And the circular dance. And the dances of Orthodox Jews?